He helped his hometown club Bury win promotion to the old Second Division before Bill Shankly paid 67,000 pounds to bring him to Anfield in March 1969. Lindsay arrived as a 21 year-old wing half or inside forward, a midfielder in today's football parlance. 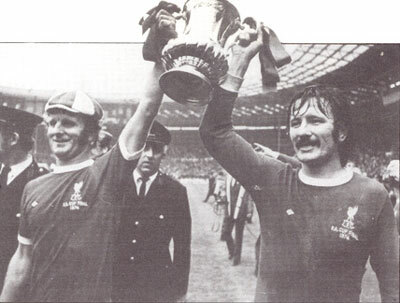 Alec Linsay and Tommy Smith with FA Cup in 4th May 1974. But Shankly and his backroom team switched the former England youth international to left back where his talents blossomed. His left foot was one of the most effective in football and he went on to earn four England caps. Lindsay scored on his Liverpool debut as a substitute at Ipswich in October 1969 but it was his penalty prowess that made him so reliable when put on the spot. His brace of penalties that gave Liverpool victory over Leicester in August 1974 made him the first Anfield player to score twice from the spot in a League game for 20 years. Lindsay, who played under the management of both Shankly and Bob Paisley, won UEFA Cup and League championship medals in 1973 and an FA Cup winners medal a year later. He joined Stoke City in 1977. The statistics of matches and goals at the top is included in the table by the conducted player of a reserve in a seasons 1968-69, 1969-70, 1970-71, 1971-72, 1974-75, 1975-76, 1976-77 not completely. 1974 v Argentina, East Germany, Bulgaria, Yugoslavia (4).